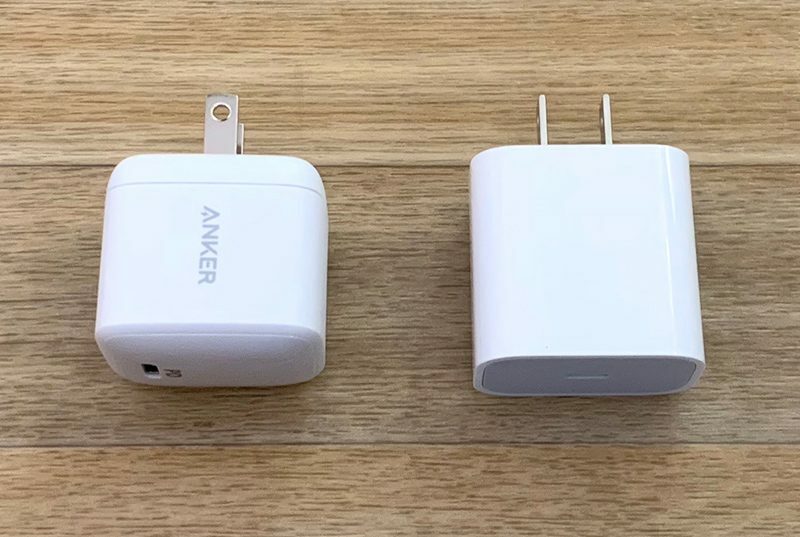 Anker recently debuted the PowerPort Atom PD 1, a 30W USB-C charger that's much smaller than the USB-C power adapters offered by Apple and, in fact, not much larger than an iPhone charger. Design wise, there's not a whole lot to say about the Atom. 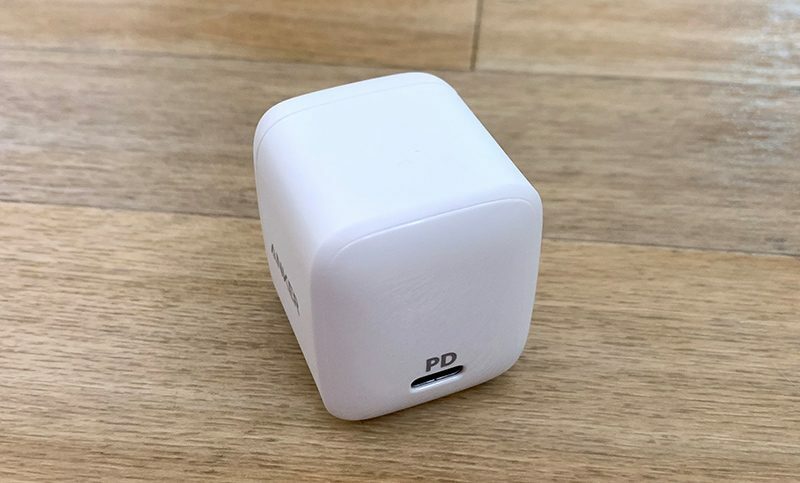 It's a small white charger that's almost cube shaped, with a shiny face and a single USB-C port that has "PD" written above it to denote its status as a USB-C PD power adapter. At the side, there's an Anker logo. 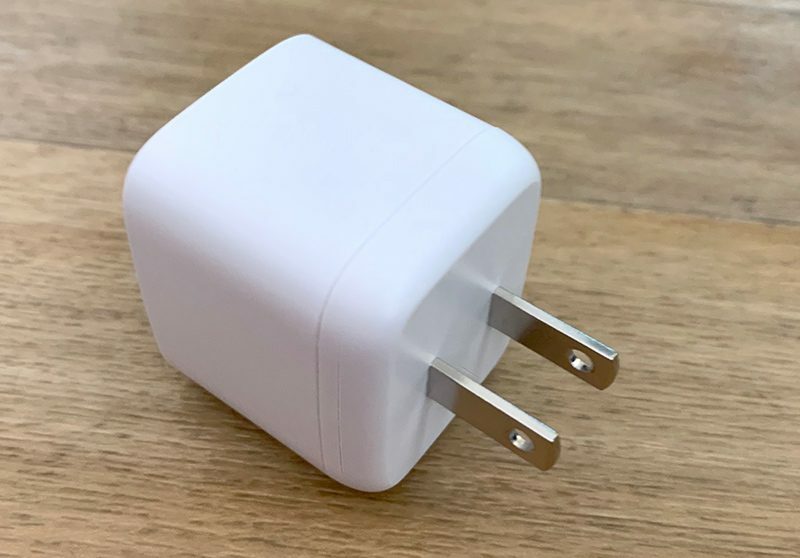 The plug at the back is not collapsible, likely due to its small size, which is one minor negative. It doesn't fold down, so the prongs are always going to be sticking out. The small size of the Atom is convenient because when you plug it in to an outlet or a power strip, it doesn't take up unnecessary space. In my case, I have a power strip in a cable organizing box, and power adapter size can be a real concern in this kind of situation. A smaller power adapter doesn't take up more than one outlet, and it can be placed in either the top or bottom slots. It's also not in the way with a power strip, and it's more versatile than Apple's own power adapters. As a 30W USB-C power adapter, the Atom is ideal for charging the USB-C enabled iPad Pro models, the MacBook, and the MacBook Air. It's not powerful enough for the 13 and 15-inch MacBook Pro models, but for all smaller devices, it's perfect. It's also ideal for use with the iPhone for fast charging purposes. If you pair it with a Lightning to USB-C cable, it will charge an iPhone to 50 percent in a half an hour. You can also fast charge older iPad Pro models that use Lightning instead of USB-C with a Lightning to USB-C cable and Anker's Atom. On the 2018 USB-C iPad Pro models, you're going to see faster charging with a USB-C to USB-C cable than you do with Apple's standard 18W power adapter. With the standard 18W USB-C power adapter that comes with the new iPad Pro models, my 11-inch iPad Pro charged to 45 percent in an hour. 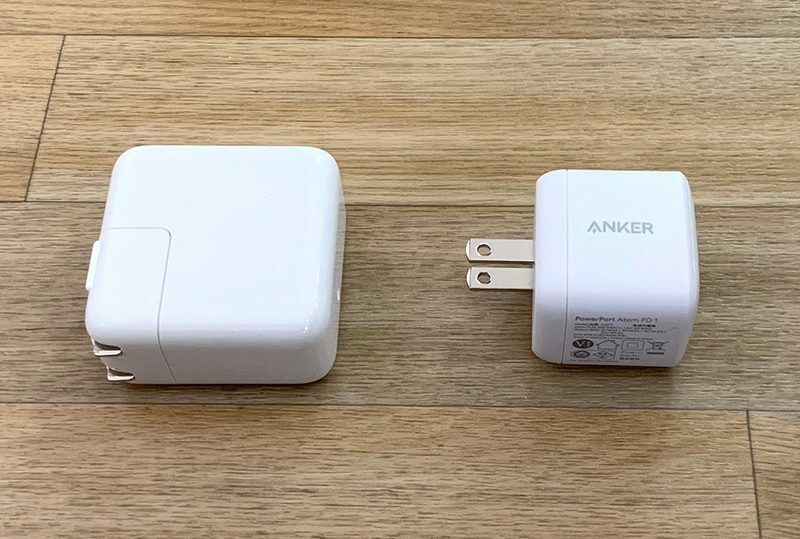 With Anker's 30W power adapter, it charged to 66 percent during the same time period. Testing was done both times charging from 1 percent in airplane mode. Apple recently began allowing third-party companies to develop Apple-certified "Made for iPhone" USB-C to Lightning cables, and Anker is set to launch its first USB-C to Lightning options in late February. I was able to test out the cables, which will be available in two varieties -- the Powerline II and the Powerline+. Anker's cables will come in three and six-foot lengths. Powerline+ is the premium version of the cable, covered in a durable and attractive braided nylon material. The version I have on hand is red, and it's a nice looking cable. Pricing for this cable hasn't yet been announced, but the standard Powerline II will be priced at $15.99. I haven't been able to use it for a long period of time to test durability, but Anker's cables are known for being well made. It certainly feels sturdy, and the USB-C and Lightning connectors at the ends are protected with a thick rubber material and an aluminum cap that prevents flexing at vulnerable points. It's usually the ends of cables where fraying happens, so the protection Anker has added should keep the Powerline+ from breaking with frequent use. The Powerline II cable is similar to the Powerline+, but it doesn't have the nylon covering. It's made from the same material as any other standard Apple cable. The connector ends are protected with a rubber material, but there's no aluminum end for added durability. Still, the thick rubber material that extends past the joint where the cable attaches to the connector is more protection than a standard Apple USB-C to Lightning cable offers, and it too should hold up well. 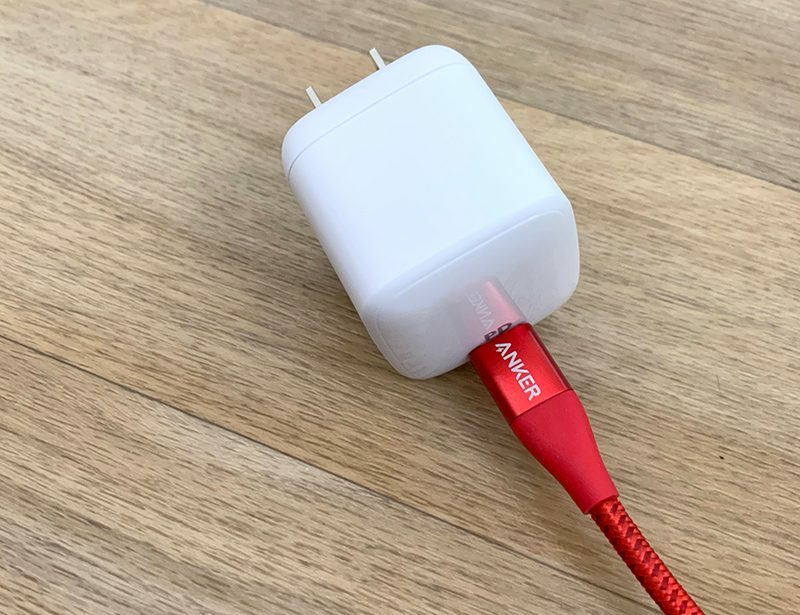 Pricing isn't available on Anker's USB-C to Lightning cables as of yet, but they're likely to be priced competitively. Apple's 1m (3ft) USB-C to Lightning cable is priced at $19.99. 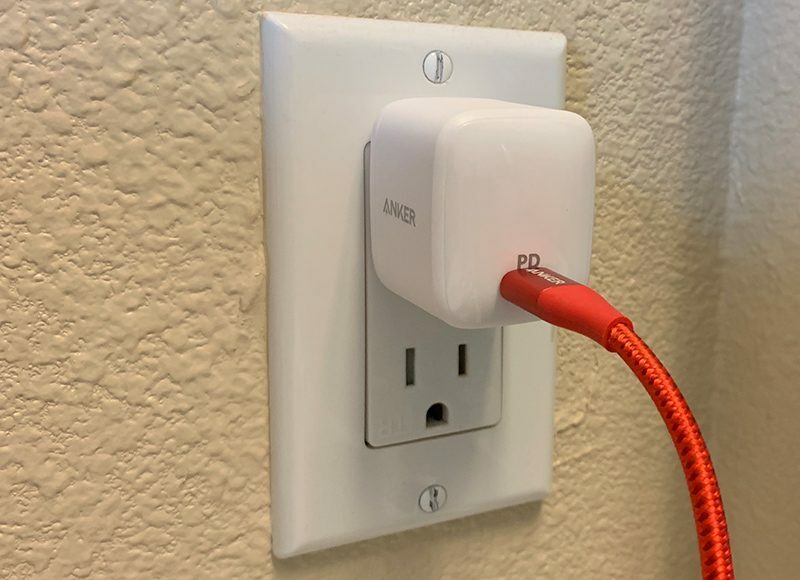 If you need a USB-C power adapter for the purpose of fast charging an iPhone or as a secondary charger for an iPad Pro, MacBook, or MacBook Air, the Atom is an ideal choice. It's small, compact, and affordable, priced $15 less than Apple's 30W Power Adapter. 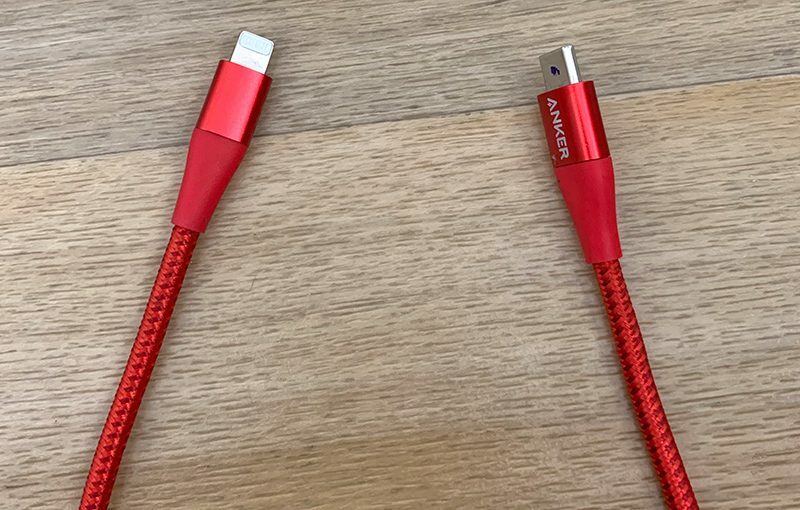 Anker's upcoming USB-C to Lightning cables offer the durability that Anker customers have come to expect from Anker cables, and will be a solid choice for those who need a USB-C to Lightning cable. You can purchase the PowerPort Atom PD 1 from Amazon for $30, and it is expected to be back in stock later today or tomorrow. The first of Anker's USB-C to Lightning cables will be launching in February, and the Powerline II is available for pre-order on Anker's site for $15.99. Is fast charging an iPhone with this PowerPort Atom PD 1bad for the battery? Device looks good. I'm tempted. The iPhone controls how fast it charges. It will throttle charging as it gets closer to full. From what I've heard listening to tech podcasts, you might shave a week or two off the battery life by fast charging and leaving it charge overnight, but that is about it. An example I've heard was this: Imagine you and all your friends are going to cram into a car. The first 4 people can all jump in at the same time. The next few can get in pretty easy too. By the time you shove numbers 10, 11, and 12 in, it gets kind of hard. Your batteries are like that. When empty, they charge pretty quick. That last 5-10% you really have to cram in. That's why some suggestions are to run your battery down to 25%, then charge up to about 75%. Keeps it in the "fairly easy" range. Here’s hoping Apple catches up and starts making this standard in the 2018 iPhones. I have a Powerline+ USB C to USB C cable that I've been using for over a year and it still looks and works as new. I don't expect these to be any different. Thanks -- clearest breakdown I've read yet on why this is so! Considering the prongs are not retractable, it doesn’t seem to save much space over the Apple chargers. Yikes, good catch. Always-out prongs are just awful in your bag. Yes, the more you fast charge the faster you will degrade your battery over time. I would definitely not use it for a bed stand. This is what I have been waiting for. I am working the 30W charger, but I want a red braid USB-C to lightning cable and red USB-C to USB-C. I am not seeing those on Ankers site yet. 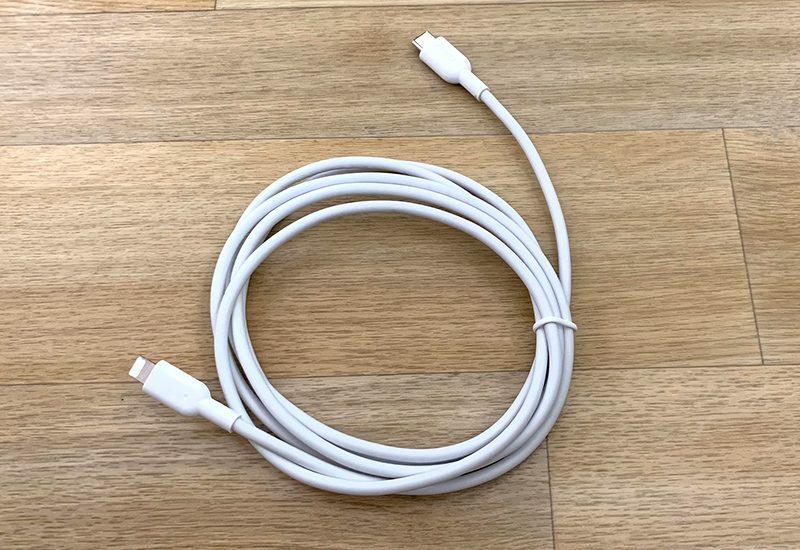 I only see the white USB-C to lightning. Did I miss it? EDIT: I see the PowerLine+ is the braided one...Price hasn't been announce so I guess no pre-orders yet. Yeah, no pre-orders for that one just yet.